Found this record Hallowe’en evening at one of my thrift store haunts. 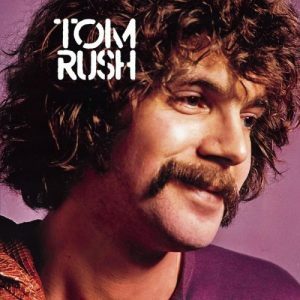 I wasn’t a huge Tom Rush fan since his peak was a bit before I found a love for folk music. What drew me to this 1970 album were two of the tracks: Old Man’s Song and Child’s Song. This was Rush’s seventh album (first for Columbia) and is a collection of 10 songs all written by other singer/songwriters. The two tracks that caught my eye were both written by Murray McLaughlan. These are iconic McLaughlan songs that have almost always been part of his sets. He performed Child’s Song when I last saw him in March 2017. I can’t imagine any angst-ridden teenager with a guitar that hasn’t tried to play this song. While I’ll always be partial to Murray’s rendition, Tom Rush has a beautiful rich voice and covers it masterfully. The sidebar to these two songs is from Murray McLaughlan’s autobiography, The Ballad of Murray McLauchlan: Getting Out of Here Alive. McLaughlan tells of moving to New York in the sixties and meeting many of the new breed of folk singers – Tom Rush being one of them. McLaughlan played both tunes for Rush who recognized the quality of the lyrics and music and offered him $1,500 for both. Given that Murray had no money and was just living hand to mouth, he had no problem accepting this offer. And McLaughlan looks back on this transaction with no regrets. He needed the money and having an established musician record his work certainly built some credibility for him as a musician. In addition to the two McLaughlan written tracks, the lead track, Driving Wheel, is by a somewhat lesser known Canadian folk singer, David Wiffen. The first time I saw McLaughlan perform was Massey Hall in Toronto in the late-seventies for his Boulevard album and it was David Wiffen who opened for him. Murray was then performing with the Silver Tractors, so his music had a harder electric sound. Wiffen by contrast was a solo singer/acoustic guitar guy with no accompaniment . He had a beautiful deep voice, but apparently the guy directly behind me had come to see Murray and was trying to heckle Wiffen off the stage. Some one else in the same row tried to shut his guy down, a fist fight ensued and Wiffen played through it all. Seeing McLaughlan some forty years later in Ottawa, the most excitement in the audience would have been an impromptu battle over the appropriate place to leave a cane or park your walker. And all of these memories from a simple find at the thrift store. Enough said about why I collect vinyl.